This year’s New London Award shortlist includes two Rolfe Judd projects, Brickfields and Clapham Southside. Both are mixed-use schemes which have achieved planning. The awards recognise the very best new and proposed architecture, planning and development in the capital. In conjunction with the London Festival of Architecture, Londoners are invited to select their favourite from the shortlist for the People’s Choice Award Voting closes Friday 22 June. 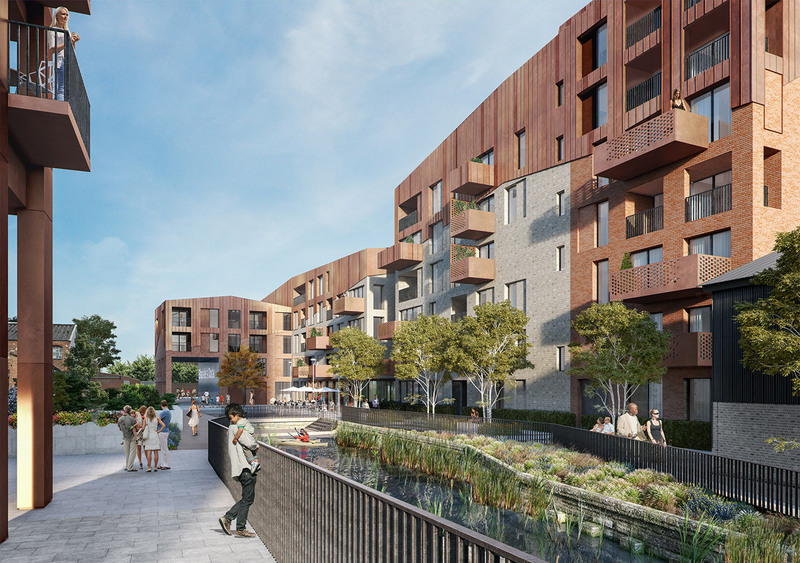 Brickfields is a residential led development located alongside the Grand Union Canal and Shackles Dock near Hayes town centre. The dock is set to become a new permanent home for The Sharks Canoe Club. Our design links to the history of the site and celebrates brick as a hand crafted construction material, the narrative is explored in our Warehouses Reimagined article. Clapham Southside transforms an enclosed, industrial site into a new inclusive place with homes, public spaces and employment. Six new architecturally stunning buildings, which vary in scale, form and materiality, are designed to respond to the surrounding context.